Mega Sale! Free Shipping Included! 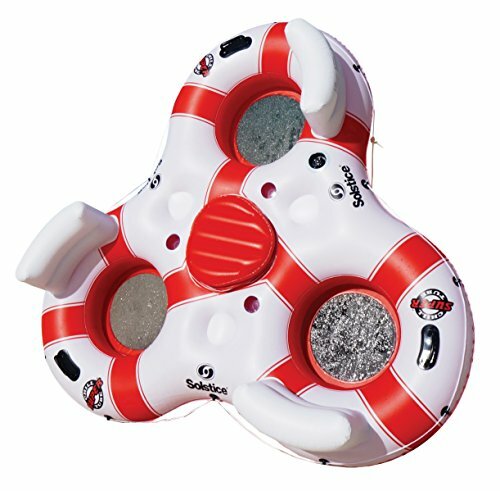 Save 25% on the Solstice by Swimline Super Chill 3 Person Island Pool Float by Solstice at Breezin Thru Charters. MPN: 17003. Hurry! Limited time offer. Offer valid only while supplies last. Solstice by Swimline Solstice super chill 3person party island with built-in cooler and cup holders is ideal for pool, marine and River rafting. Solstice by Swimline Solstice super chill 3person party island with built-in cooler and cup holders is ideal for pool, marine and River rafting. Cooling and supportive nylon mesh insert seats for ultimate comfort. Made of heavy duty vinyl with sturdy vinyl handles and an all around grab line. Has it's own on-board ice chest and drink holders. Comfortable pillow back rests for ultimate relaxation. Boston valves for quick inflate/deflate. Measures 81" x 78" inflated and will accommodate up to 600 lbs. If you have any questions about this product by Solstice, contact us by completing and submitting the form below. If you are looking for a specif part number, please include it with your message.